example below and tailor it to your own needs. Unimpressed by this template? Browse our full library of cover letter templates. 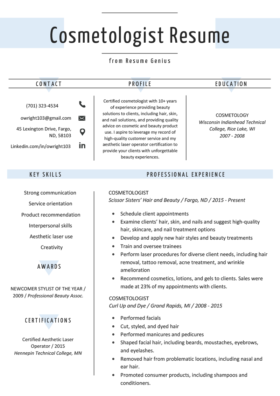 I am writing to apply for the cosmetologist position that you’re advertising on Indeed.com. As an experienced cosmetologist with over 11 years of experience, I believe that I can hit the ground running when you open your new location in Grand Forks. I have substantial experience providing tailored beauty solutions to clients, including nail, hair, and skin solutions. Additionally, I am trusted by customers: I have successfully upsold products to the clientele of my current workplace during ¼ of all consultations. I believe that I have garnered the recognition and certifications needed to excel at your clinic: In 2015, I became a Certified Aesthetic Laser Operator, and I was recognized as 2009’s Newcomer Stylist of the Year by the Professional Beauty Association. I am aware that your Grand Forks location will open in September. On the basis of my experience and attributes, I believe I will be an asset to your clinic, providing your future clients with unforgettable beauty experiences that will convert them into regular customers. I hope that I have provided you with an idea of why I would make an outstanding addition to your team. Thank you for considering my application for the role, and I look forward to hearing back to you. I can be reached on (701) 323-4534 or at awright103@gmail.com. Once again, thank you for taking the time to consider my candidacy.